RICHMOND, Va. (AP) -- Virginia Gov. 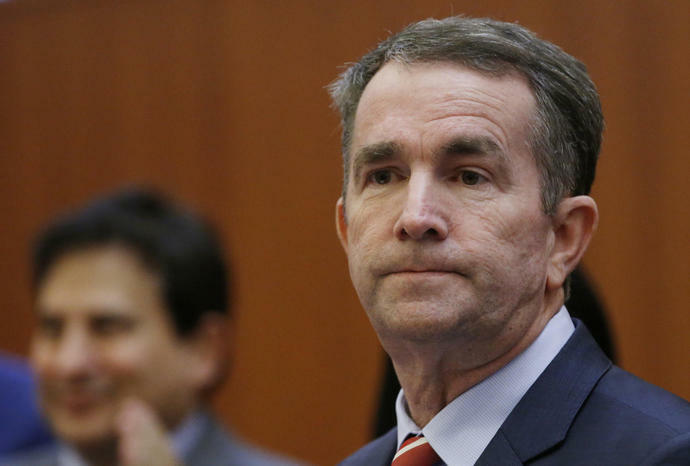 Ralph Northam apologized on Friday for a racist photo in which he appeared more than 30 years ago, but said he did not intend to heed calls to resign from both Republicans and prominent fellow Democrats, including several presidential hopefuls. The yearbook images were first published Friday by the conservative news outlet Big League Politics. The Virginian-Pilot later obtained a copy from Eastern Virginia Medical School, which Northam attended. The photo shows two people looking at the camera - one in blackface wearing a hat, bow tie and plaid pants; the other in a full Ku Klux Klan robe. In his first apology, issued in a written statement Friday night, Northam called the costume he wore "clearly racist and offensive," but he didn't say which one he had worn. Northam's political viability hinges on whether he can maintain support among the state's black pastors, officials and state lawmakers, many of whom have long personal relationships with the governor since he first ran for state Senate in 2007. "What has been revealed is disgusting, reprehensible and offensive," the statement said.